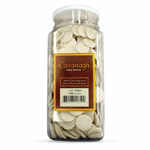 Baked exclusively for Celebrate Communion by Cavanagh Altar Bread, these large wafers are hand cut and prepared in a dedicated gluten-free bakery using positive air pressure to create a totally contaminate free room. Unleavened recipe is garbanzo bean flour, potato starch, tapioca flour, whole grain sweet white sorghum flour, fava bean flour and palm oil. 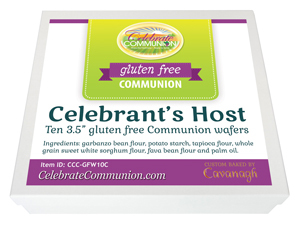 Oversized gluten free Communion wafer measures 3.5 inches in diameter and is boxed in quantities of 10. One year shelf life from date of manufacturing. 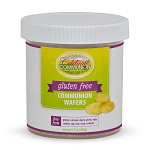 This product is not approved for sacramental use by the US Conference of Catholic Bishops. NOTE: To be considered gluten free the FDA requires the gluten content to be below 20 parts per million. Gluten content on this wafer is approximately 8 parts per million for serving size of 1/4 wafer.